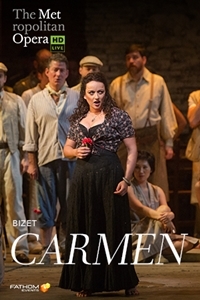 Fathom Events and the Metropolitan Opera present a broadcast of Bizet's Carmen, live in select cinemas nationwide on Saturday, February 2. Clémentine Margaine is opera's ultimate seductress, opposite Roberto Alagna, who captivated Live in HD audiences as Don José in 2010. Louis Langrée conducts Sir Richard Eyre's lively production, a favorite in the Met's repertoire. Run Time: 3 hr. 40 mins.